Mother’s Day this year is Sunday, May 14th, and it’s time to start planning a special day for mom. It could be easy to resort to what you’ve gotten your mom year after year: A card, bouquet of flowers, brunch at her favorite restaurant, or a day and dinner with all the family together. These are all wonderful ideas to celebrate one of the most important women in your life, but why not surprise her with something different, maybe something that she’s never done before, like a wine tour in Santa Barbara! Silk Road Transportation & Wine Tours offers an all-inclusive picnic lunch from a local restaurant and a wine-tasting tour of Santa Barbara’s beautiful wine country with professional and knowledgeable door-to-door service. We offer shared tours with other guests or you can book your own private tour; we usually have time to see 4 wineries during a Santa Barbara wine tour. We’d love to help make this Mother’s Day special for the most important woman in your life. We know that you are the expert in making your mom feel loved and appreciated, because you know her best. We also realize that sometimes it’s hard to think of new ways to celebrate her on Mother’s Day and make her know how much you love her. We’d love to give you some fresh ideas so you can make your mom’s Mother’s Day the best she’s had yet. Obviously, we do suggest that you treat your mom to a wine tour through Santa Barbara’s beautiful wine country. If she loves wine, whether she is a connoisseur with expensive taste or just one that loves to relax after a long day with a glass of red, she will definitely love our wine tour. Book a tour with Silk Road Transportation and we will take care of the rest! Invite those family members and friends that mean the most to your mom and enjoy a day in which you can treat your mom and also create memories that you will remember for years to come. Relax and let us to the rest! We offer limos and other luxury vehicles for our wine tours in Santa Barbara! We highly suggest that you book in advance so that you can have all that you want to make your mom feel special. As mentioned earlier, we offer shared tours which can be a great way to enjoy a day of wine tasting with other tourists like yourself, or reserve a private tour so that you and your mom, and perhaps those closest to your mom, can create your own memories and enjoy your Santa Barbara wine tour at your own pace. Why not make the a day of wine touring in Santa Barbara a surprise? We understand that not everyone likes a surprise, but an event specifically for your mom can be something fun for her to look forward to in the weeks leading up to Mother’s Day. Instead of simply inviting your mom over the phone or through a text, create a special invitation just for her and give it to her in person. Another idea is to purchase a bottle of wine from one of the wineries that will be on your wine tour and attached a special message inviting her to spend the day with you! A day with just the two of you would be a special day, but a day with other family or friends involved could also be a great way to show how many people love and appreciate your mom. Invite your siblings or limit it to a girls day and only invite your female family members. You could include your mom’s dearest friends for a day that is sure to be filled with lasting memories. Book Your Santa Barbara Wine Tour! 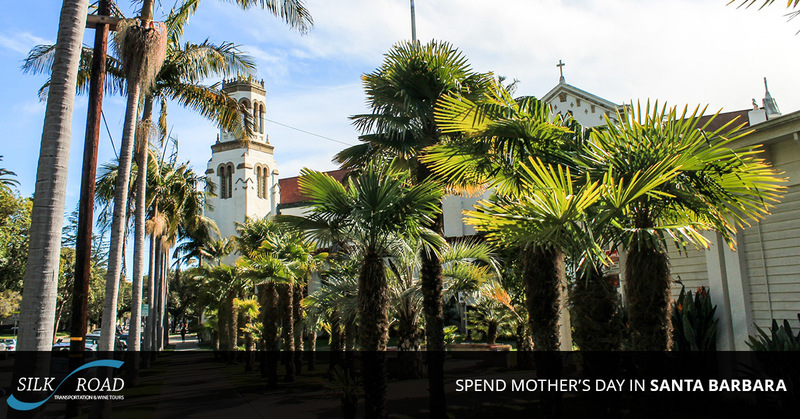 However you choose to celebrate your mom this Mother’s Day, we hope that you will choose a wine tour in Santa Barbara with Silk Road Transportation & Wine Tours. We’d love to help you celebrate your mom this Mother’s Day! Have questions about our services? Contact us!